We know: You love guacamole, and maybe you’re even such a guac expert that you’ve mastered some more unusual avo-dip recipes, like this one with sun-dried tomatoes and wine, or this one, which is packed with beans. This delicious salad, served on crisp Melba toast, couldn’t be easier to make…or more impressive when served at the table. While the recipe calls for fresh crab, there’s absolutely nothing wrong with buying pre-packaged lump crab — your guests won’t know the difference. You can purchase the mini Melba toasts for this appetizer, but we recommend slightly larger toasts because your guests will definitely want more than a bite with this one! If you want to serve something a bit heavier than the usual appetizer, you can’t go wrong with flautas, tortillas that have been stuffed with seasoned chicken, rolled into a cigar shape, and fried until temptingly crispy. 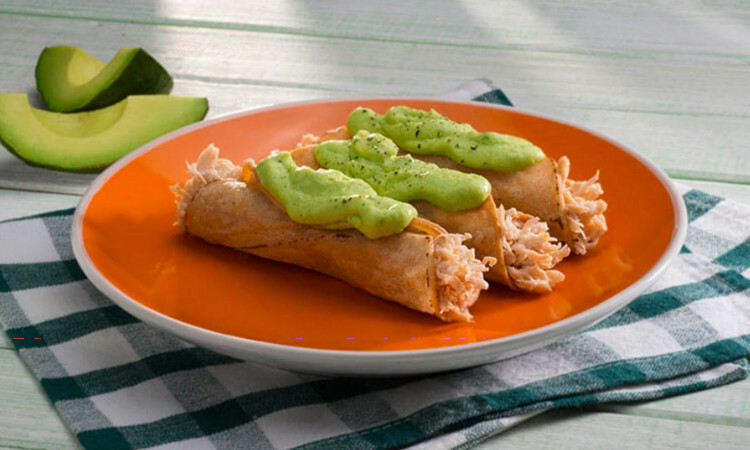 This recipe calls for the flautas to be topped with a daub of avocado sauce, which you can spoon on or — if you really want to impress — pipe on with a pastry bag and star-shaped tip. Just can’t let go of the idea of serving guacamole at your dinner party? That’s ok! You can change the way it’s served and turn it into something entirely new. Instead of chips, put a dollop of guacamole on cucumber slices, then garnish them with feta cheese, black olives, and a pop of bright red roasted pepper. Use the same guacamole and serve it in yet another vessel: cherry tomatoes! This recipe is so simple, but your guests don’t have to know that. They’ll love the contrast of colors, the flavor, and the simplicity of picking it up and popping it right into their mouths! Salads are an excellent addition to a spread of appetizers, and this palm heart and avo salad achieves a particular trifecta: It’s easy to make, it’s gorgeous, and it’s delicious. You’ll see guests sneaking back to the apps table for a second serving of this one.